Club Development Newsletter – March 2017 We have a 2-phase development plan (optionally with Phase 3 if sufficient funds become available): Phase 1: Apply for funding in order to renew and extend the southern end of the clubhouse and prepare the relocation of Croquet Lawns 3 & 4 to the southern end of the grounds (where the grass courts currently are). At the same time extra parking spaces would be created within the club entrance and around the astro courts. A key part of this phase would be to open a new fitness studio in the clubhouse, generating revenue and attracting new members and greater footfall. The studio would be air conditioned and purpose built, and be hired out for a variety of classes (including fitness, yoga, pilates and dance). The income from the fitness studio would be crucial to paying back loans from the LTA and making club development viable. Phase 2: Install three artificial clay courts next to the northern end of the clubhouse, and apply for funding for an extension to the norther end of the clubhouse to include a patio area overlooking the ‘show courts’ (once the croquet lawns have been successfully relocated). Phase 3: If additional funding is available at a later stage, then we would look to build an indoor tennis facility. After a quiet period over the winter, we now have a clear way forward for club improvements. Recent discussions with the LTA have been encouraging. It’s agreed that a step by step approach is most likely to attract outside funding and to be realistic and affordable. The first phase now focuses on improving the southern end of the clubhouse, adding a fitness studio, converting 3 grass tennis courts to clay and adding more parking spaces. We’re currently working on the details and costings so that the committees and members will be able to see and comment on the plans, costs and funding proposals. In the past 12 months the Club Development team has been busy attending meetings with the Lawn Tennis Association (LTA) to discuss objectives and funding opportunities, liaising with Poole Borough over planning, and commissioning a local architect do draw up plans for the clubhouse and grounds. 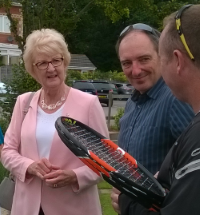 We were also delighted to have a visit from the LTA President Cathie Sabin in August 2015, including the chance to discuss our development plans.